Are you interested in a career in dentistry? Have you always wondered what kind of education dental professionals go through? Perhaps you’re just interested in peeking behind the curtain to see what happens in a typical dental office. Well, you’ve come to the right place. Dentistry is a rewarding profession where we get to help others, are constantly learning, and regularly change people’s lives for the better. Here we’ll go over the basics of career paths there are in dentistry, the benefits and the challenges of the field, and some tips on how to get started down your own dentistry career path. What Kinds of Careers are There in Dentistry? Let’s start off with discussing just what happens in professional dentistry. There are many different and required roles in any given dentist’s office, without even including the dentist themselves. Dentists have a similar role regarding your health to your family doctor in that we look after your general oral health instead of specializing in a specific area. A dentist has graduated with a doctorate from a dental school and are licenced to practice dentistry. One major focus is on health management and prevention, which means we regularly check our patients for signs and symptoms of any oral, cranial (head), lymph, or neck-related health issues. We are also responsible for performing all of the dental procedures that go beyond routine cleanings. Beyond general dentistry there are areas that dentists can specialize in after completing additional schooling after graduating from dental school. These specializations may include orthodontics, which is an area that is chiefly concerned with jaw and teeth alignment, and periodontistry, which is concerned with the gums and supporting structures of the mouth. An oral and maxillofacial surgeon is another specialization that carries out oral and some facial, head, and neck bone surgeries and reconstructions. If you need to see an oral and maxillofacial surgeon, you are probably dealing with more significant dental issues than most. Cosmetic dentistry, also known as aesthetic dentistry, is concerned with the appearance of teeth, gums, and bite. Cosmetic dental work can work wonders for improving self esteem and repairing damage caused by physical injury, neglect, or natural development that’s not aesthetically pleasing. 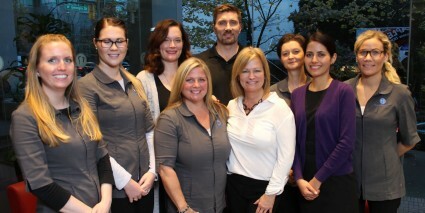 This is the team at Georgia Dental in downtown Vancouver, which excels at cosmetic dentistry. There are other career paths in dentistry that do not require a doctorate but are essential in a dental practice. Dental assistants help the dentist by sterilizing instruments, ushering patients into exam rooms and through procedures, taking x-rays and impressions of patients’ teeth, and more. 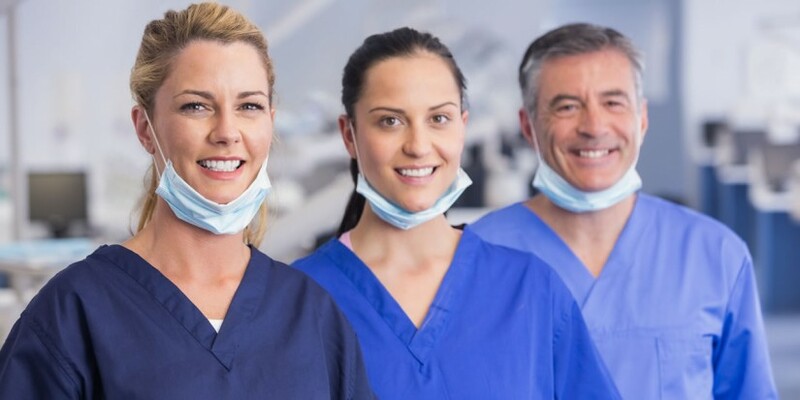 Dental hygienists have more responsibility than dental assistants, including carrying out routine oral cleanings and checking patients for oral decay or disease. Hygienists often get mistaken for dentists because of how knowledgeable and competent they are, and because they’re the ones you see the most of during a cleaning. Without our dental receptionists, we couldn’t get anything done! Although they aren’t required to have dental education at the same level as the other positions, a dental receptionist often has to understand many different facets of life at a dental office. When you call the clinic, get appointment reminders, or have your insurance explained to you, it’s usually the receptionist who’s there to help you, smiling and reassuring all the way. Finally, dental laboratory technicians work in labs that manufacture dental appliances for patients based on dentists’ recommendations. Typical items of this nature include custom mouthguards and oral retainers. Do you sleep with a retainer or night guard in? If so, these are probably the ones you can thank for it. The majority of working in dentistry involves interacting with patients. People skills are extremely important in this industry as our client base will either grow or shrink based on the customer service we give and your bedside manner. A dental professional’s job, no matter which position, is to ensure that patients are comfortable and confident that they are receiving excellent dental care. A desire to help people and to improve the lives of others is also an essential part of working in dentistry. As dental professionals, we hold the unique position of helping to significantly improve the health and functioning of others. With that comes the authority and responsibility to educate patients about better oral health practices as well. Since dental offices are a place where many patients feel uncomfortable or even frightened, our ability to soothe fears and provide a reassuring presence can make or break a person’s ability to seek treatment. This level of responsibility and trust is one we take very seriously. Dentistry involves very precise handiwork, whether you are cleaning in between a patient’s teeth, filling a cavity, or trying to remove stubborn stains. Dexterity and attention to detail when working to fix a patient’s oral issues are crucial traits to have as a dental professional, in some ways similar to a sculptor or craftsman. Dental appliances created for patients, such as retainers and mouthguards, must always be properly fitted and designed by qualified dental professionals. No two apparatus are the same, and each address the specific needs of each patient. Making sure that the dental appliances meet these needs requires a keen eye, an ability to problem solve, and an acute attention to detail. Thinking of creative solutions to a patient’s oral issue, whether that involves designing a dental appliance or thinking of a treatment plan that better suits a patient’s lifestyle, will help you excel in a profession where no two solutions are the same. If you are perhaps thinking by now that dentistry may be the profession for you but you’re not quite sure how to get there from where you are now, read on, curious one! Here’s a step by step outline of the dental education needed to become a dentist (supporting positions typically have less demanding educational requirements, and we’re not addressing them below). Earn a bachelor’s degree. It doesn’t really matter in what your degree is in but you should keep in mind that once you apply for dental school, you will likely be required to already have completed courses in biology, physics, chemistry, among others. Because of this, most aspiring dental professionals choose to complete their bachelor’s degree in chemistry or biology to avoid having to take extra classes in the end. You may find it worthwhile to look for colleges and universities that offer a pre-dental program. These programs ensure that you meet dental school admission requirements and will also prepare you for the Dental Admissions Test that you will need to complete in order to be accepted into dental school. Get accepted into dental school. This includes passing the Dental Admissions Test which covers areas such as chemistry, biology, perceptual ability, reading comprehension, and reasoning. If you are exclusively interested in becoming a dental assistant, you are only required to obtain a diploma or certificate, depending on the program, which takes significantly less time than becoming a dentist. There are tons of dental programs all over the world, through large and small institutions alike. With so much choice, it is likely that you can find a school that will work with your budget and schedule. Graduate from dental school. This may be easier said than done for some, but if you work hard and are determined you should pass with flying colours. Dental school, like any bachelor’s degree in Canada, is four years long with each year building on what you learned in the last. Generally, the first two years consist of basic instruction supplemented with work in laboratories where you try out your skills. The last two years include clinical studies where you participate in active dental practices under the supervision of a licensed dental professional. Figure out if you want to specialize or not. While most dental school graduates work in general dentistry, it has been proven that dental school graduates are the most hirable when they have specialized in something. Of course specializing means taking additional school and can mean obtaining a master’s degree, so you’ll want to weigh your options with that in mind. Specialties include orthodontics, periodontics, endodontics, pathology, radiology, and many others. Register with the College of Dental Surgeons. Regardless of whether you want to be a dentist or dental assistant, you must register in order to legally work in the province of BC. Registering includes a criminal record check and an annual renewal. Find a job within an existing practice or start your own! Most dental professionals find employment within private practices or buy pre-existing practices, but there are a minority who work within hospitals and regional health units. Specializing may make it easier to find employment, even if you just wish to work in general dentistry, but in the lower mainland dentists are generally in demand. Almost 89% of dentists in Canada work in general practice while 11% are specialized practitioners. Wherever and however you decide to work, dentistry will provide you with a profession that grows, changes, provides, and helps you to change the lives of others for the better. If there’s anything else you’re curious about or would like to ask us any questions, please feel free to reach out on social media. We always love to chat!